If Mike Leach Had Gotten His Dream Job, How Would College Football History Have Changed? In 1996, a little-known assistant named Mike Leach applied to become head coach of the Key West High Conchs. If he had settled into island life instead of spreading the gospel of the Air Raid, would anything about the sport's past 20 years be the same? I want to go back to the island, Where the shrimp boats tie up to the pilin'. Give me oysters and beer for dinner every day of the year, And I'll feel fine, I'll feel fine. When Mike Leach was Hal Mumme’s offensive coordinator at Iowa Wesleyan in the early 1990s, the coaches would listen to Jimmy Buffett’s A1A to keep their minds warm as they drove on snow-covered roads. But Leach didn't truly understand what Buffett meant on the album’s last track—his first song about Key West—until a weekend break during a recruiting trip to Florida took Leach down the Overseas Highway to the southernmost point in the continental United States. After two days spent people-watching, Leach knew. He had to come back to this place, preferably for a long time. By the start of 1996, Leach and Mumme had been at Valdosta State for four seasons. Leach, a $48,000-a-year Division II offensive coordinator, noticed that his dream job had opened. He’d have to take a pay cut, but he didn’t care. He applied to become the head coach of the Key West High Conchs. He didn’t get the job. Not enough experience, Leach remembers hearing when he learned he wasn’t hired. Key West hired a coach from New England named Fred Dennen. He didn’t make it through his first season. Leach, meanwhile, followed Mumme to Kentucky the following year and set records with quarterback Tim Couch at the helm of Leach’s Air Raid offense. In 1999, Leach got hired at Oklahoma to run the offense for first-year head coach Bob Stoops. A year later, Leach was running his own program at Texas Tech. He had wanted to coach the Conchs. He had to settle for revolutionizing offensive football at the college level. From there, a parallel football universe spins forth. “This is like It’s a Wonderful Life,” cracks Key West attorney and sixth-generation Conch Bill Spottswood, who served on the search committee that didn’t give Leach the job and who befriended Leach years later when the coach bought a house on the island. The Air Raid that Leach and Mumme created and that Leach made famous at Texas Tech swept through Texas, and coaches from across the country borrowed concepts from it. Currently, six of the 10 Big 12 offenses run a version of the Air Raid. But what if Leach had run it in Key West instead of in Lexington and Norman and Lubbock and Pullman? 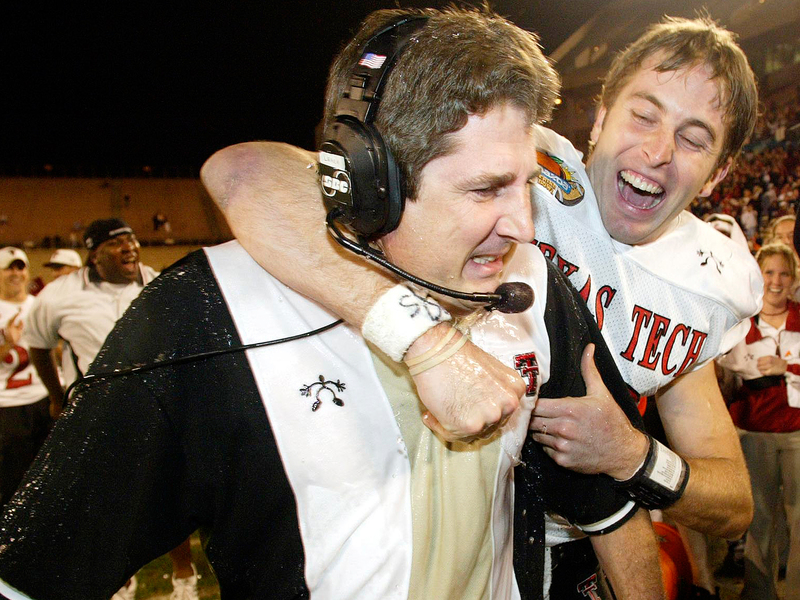 In the real world, Leach turned Texas Tech into his Air Raid test tube and ultimately launched the coaching careers of his disciples, including legendary Red Raiders QB and current head coach Kliff Kingsbury (right). Given the relatively low pay a public school teacher–coach receives, would Leach have stayed at Key West? Greg Kremer, who was the Conchs’ athletic director in ’96 and still teaches at the school, wonders if Leach might have been lured away. Kremer, who did not get to choose the coach that year, remembers meeting Leach—at a TGI Friday’s, he believes—and thinking him overqualified for the job. “I wonder how happy he would be here at the end of the road at a school not known for football,” Kremer says. West Virginia coach Dana Holgorsen suggests that Leach never would have left Key West. Spottswood insists he would have made sure the coach stayed. Leach does have a law degree from Pepperdine, and Spottswood does run a law firm. “He might have wound up practicing in my office if I had to keep him there,” Spottswood says. On the field, Leach would have inherited a roster stocked with speed but lacking in size and depth. He would have fielded varsity teams full of would-be Wes Welkers with rosters numbering in the 20s, and if he made the playoffs, he would have had to face South Florida powerhouses such as American Heritage in Plantation and Glades Central in Belle Glade. The Air Raid, which at the college level has befuddled even more formidable defenses, definitely would have worked. And the moment Leach’s Conchs upset an American Heritage or a Glades Central, everyone in South Florida would have tried to copy it. Suddenly, the area that produces the best players in America would have been Air Raid crazy. And as South Florida teams used the offense to whip their northern counterparts in the playoffs, the offense would spread throughout the state. By the early ’00s, Miami, Florida and Florida State would be under pressure to switch to the Air Raid to better blend in the talent from high schools. And there would have been no respected offensive coach at those schools to stem the tide. Steve Spurrier had left Florida for the NFL after the ’01 season. Florida State was mired in the Jeff Bowden era on offense, and even Bobby Bowden wouldn’t have had the capital to cling to the old ways. At Miami, Larry Coker was viewed as a guy cashing in on Butch Davis’s recruiting bounty. At the high school level, Florida would have become what Texas became: a laboratory for offensive explosiveness. At the college level, the Sunshine State’s Big Three would be what the Big 12 is now. All because of a full-time football coach–part-time lawyer working magic at the end of the world. 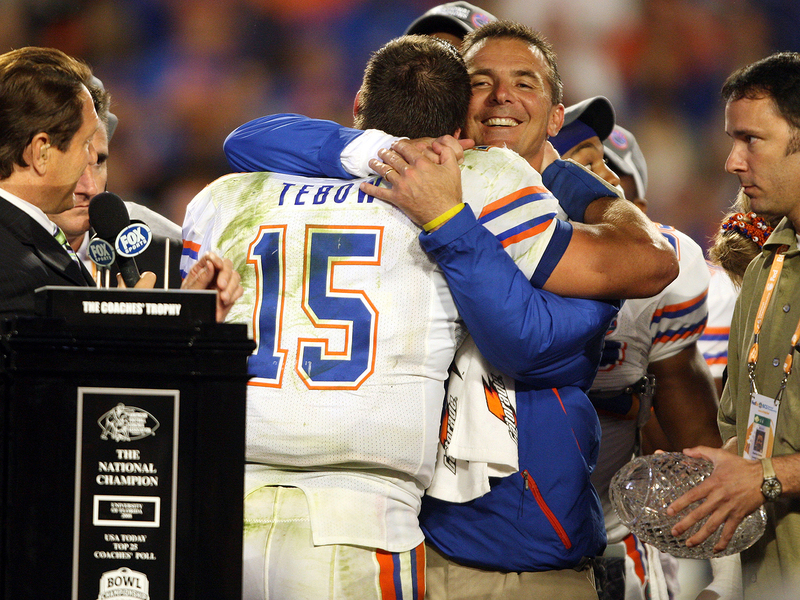 If the rise of the power run game began in Big 12 country, maybe Urban Meyer and Tim Tebow cap the 2006 season with a title celebration together on the opposite sideline. So what about the rest of the football universe? Let’s start with Kentucky. Mumme still probably would have been hired by the Wildcats prior to the ’97 season, but his actual history at Kentucky without Leach (6–6 in ’99, 2–9 in ’00) suggests the Wildcats might not have wowed the SEC with their aerial prowess. In the real world Leach got the Oklahoma coordinator job because his offense drove Stoops mad when Stoops was the defensive coordinator at Florida. Without Leach at Kentucky to inspire Stoops to run the Air Raid at Oklahoma, things get interesting. Stoops likely would’ve hired former Kansas State co-worker Mark Mangino as the offensive coordinator instead of as offensive-line coach. (Mangino became the OC after Leach left.) Mangino would’ve installed Kansas State’s offense, which embraced the dual-threat quarterback long before the trend was in vogue. But it wouldn’t have been the shock to the system the Air Raid turned out to be. Meanwhile, Texas Tech likely would have still pursued Clemson’s offensive coordinator, Rich Rodriguez, to fill its coaching vacancy in 1999. But when Rodriguez pulled his name from consideration, the Red Raiders wouldn’t have been able to turn to Leach, so they might have upped their offer to Rodriguez. Maybe he would have taken the job. Imagine: Instead of an up-tempo, spread-out, pass-happy offense, Rodriguez brings an up-tempo, spread-out, power-run offense to the Big 12. The read option, his signature innovation, takes the league by storm. Everyone in Lubbock is thrilled except for the redshirt sophomore quarterback Rodriguez inherited. (“I’m not really the type of runner to run coach Rodriguez’s offense,” Kingsbury says now. “So I don’t know where I’d be. I don’t like getting hit that much.”) Kingsbury winds up on the bench behind B.J. Symons, a better fit for Rodriguez’s run-heavy scheme. Meanwhile, Rodriguez falls in love with a minor prospect from Oklahoma City and makes him the featured tailback. Welker, who played receiver for Leach, breaks every rushing record Texas Tech has. Kingsbury, a sixth-round pick by the Patriots in 2006, never plays in the NFL and never gets bitten by the coaching bug. Instead, he pursues his original dream of becoming a securities trader. • What if ... Chris Leak had scrambled for a first down against LSU in 2004? Rodriguez, a West Virginia native, probably still would have been offered the Mountaineers’ job after coach Don Nehlen retired in 2000. But in our alternative reality he turns it down, believing he can win the Big 12 at Texas Tech. Back at Oklahoma, the Sooners are far better off than they were under Stoops’s predecessor, John Blake, but they haven’t satisfied their fans. Without Leach bringing the Air Raid in 1999, they don’t win the 2000 national title. They still win the Big 12 in ’02, but the fanbase wants more. Meanwhile, Texas coach Mack Brown, after losing to Rodriguez’s Texas Tech team in ’02 and ’03, decides to mimic Rodriguez’s offense to better highlight the skill set of a redshirt sophomore named Vince Young. Young runs for 196 yards and three TDs in the Longhorns’ ’04 win against the Sooners in Dallas. That loss keeps Oklahoma from winning the Big 12 South title, increasing howls from the faithful. Oklahoma athletic director Joe Castiglione has no intention of firing Stoops, but Stoops remembers the advice former boss Steve Spurrier gave him: Don’t stay somewhere where they complain about 10-win seasons. After Florida fires Ron Zook in ’04, Stoops reaches out to pal (and Gators athletic director) Jeremy Foley. Stoops promises to run the Air Raid offense that has swept the state, and Foley is thrilled to hire the guy who turned him down before he hired Zook. This leaves Oklahoma without a coach. Castiglione’s list is obvious, though: It begins and ends with Utah coach Urban Meyer. Castiglione just has to beat out Notre Dame—which just fired Tyrone Willingham—for the hottest coach in America. In the real world Meyer chose Florida because he felt he could win faster and more consistently there than at Notre Dame. But in our fantasy, Meyer's offense is perfect for the new Big 12. Texas high school programs, which had been trending toward pass-happy spreads before Rodriguez arrived at Texas Tech, had incorporated many of the same principles of the Rodriguez offense that Meyer had borrowed when creating his own spread offense. Meyer has a virtual buffet of backs and receivers suited to run his scheme. Of course, he also has inherited Adrian Peterson. Meyer knows he needs two things to get Oklahoma over the hump. Young must leave Texas, and the Sooners must grab the correct quarterback. But in doing research on the Florida opening, Meyer has discovered a brawny quarterback near Jacksonville. Tim Tebow isn't a great fit for the Air Raid offense, but he's ideal for the new Big 12. Meyer convinces Tebow to leave his home state, and Tebow enrolls at Oklahoma in January 2006. Later that year, Tebow and Peterson line up in the same backfield. A national title is all but assured. A decade later, Leach has taken the Key West High Conchs to the playoffs 12 times in 20 seasons and won two state titles. He has mastered lobster mini-season, giving his team time off from camp every July so each player—and the head coach—can bag 12 spiny critters in a two-day span. As the pirate looks toward 60, he's content. He never made enough money to buy Miami, as a certain crooner would say, but if he wants oysters and beer for dinner every day, he can have them. Up on the mainland, a debate rages as to whether Florida's college teams need to adjust the Air Raid to create more offensive diversity in the state.